You are currently browsing the tag archive for the ‘fischer’ tag. Louisville Mayor Greg Fischer delivered his first State of the City address Thursday. Fischer acknowledged the city’s shortcomings and said Louisville must rise above the second tier: The city has lost thousands of jobs in the last decade; educated residents have moved away; and current graduation rates are below expectations. Fischer says he wants the Brookings Institution to help craft a new economic development plan—a plan that includes working with nearby cities. “I’ve spoken with the respected Brookings Institution to work with us to develop a new economic blueprint—a plan that includes Louisville working together with Lexington to grow the I-64 corridor into a super-region, along with the I-65 corridor,” he said, later adding that the consequences for not reaching beyond the city border could be dire. “We need to look at our geographical cluster—Louisville, Lexington, E-town, Southern Indiana—as a geographic cluster that in 20 years will be viewed as a mega-city by the world. If we don’t have that population mass of 2.5-3 million, we will not be relevant in the view of the world 20 years from now,” said Fischer. Fischer also acknowledged an $18 million gap in the city budget. While the economy played a role in the shortfall, most of the gap comes from a legal settlement with retired firefighters. Afterward, the mayor said he’s not sure how he will make up for the gap when he drafts the budget for the next fiscal year. Fischer says he is determined not to raise taxes. The city budget has come up short for the last three years. Cuts in those budgets included layoffs and the sale of city property and equipment. Louisville Mayor Jerry Abramson delivered his final State of the City address Thursday to the Rotary Club. The speech included his vision for Louisville over the next five years. The mayor says many of the accomplishments during the period will be the continuation or completion of projects he’s championed in the last few years. They include the Museum Plaza complex, expanded operations at G.E.’s Appliance Park and Ford’s two Kentucky plants, and the start of construction on two new Ohio River Bridges. “My hope is by the end of this year—by the end of my administration—the bi-state authority will have a game plan and a financial plan in place to finance the construction of the two bridges and the reconstruct of Spaghetti Junction,” he says. The mayor says the city will have to work with Southern Indiana and the rest of Kentucky to be successful. The only element of Abramson’s plan that will come online while he’s still in office is the new downtown arena. It will open in November, just before Abramson leaves office to run for Lt. Governor next year. Abramson’s speech looked ahead to 2015–a year when he imagined the city would be coming alive with new developments and attractions. Fischer, however, said Louisville will be irrelevant by 2031 if it does not work more closely with Lexington, southern Indiana and Elizabethtown, a partnership Abramson nodded to. When you look at it this way, the difference between the two mayors’ visions for the city is stark. Like Abramson, Fischer didn’t hide his affinity for Louisville, but the new mayor also described the city as one that’s at risk of becoming out of date and has to overcome a decade of declining employment and education in order to survive. On WFPL, I reported about some difficulties Louisville (and many cities and states) may soon have pursuing green initiatives. Sustainable construction and improvements cost money. For the last two years, much of the money for these projects came from the federal stimulus package. Without the stimulus money and without earmarks (most likely), it will be hard for cities and states to afford these projects. Mayor Greg Fischer says he’s aware of this, and he says the cost difference between standard development and green development has shrunk. That’s the up-front cost, though. In the long run, it’s possible that these improvements will pay for themselves (and then some), with lower utility bills. This is what happens when an economic recession overlaps with the run-up to an environmental catastrophe. Cash-strapped cities would benefit from green developments, but they can’t afford the cost of entry. After first naming the committee that will search for a new health director, Mayor Greg Fischer has appointed the members of two more committees. The latest panels will oversee the review of Metro Animal Services and the search for a new director. Council members Kelly Downard and Tina Ward-Pugh were likely among the clearest choices for the final group. Both were active in questioning former director Gilles Meloche whenever he appeared in the council. Mayor Greg Fischer has released the names of the members of the committee that will search for a new Public Health and Wellness Director. The new director will replace Dr. Adewale Troutman, who is leaving the post for a job in Flordia. 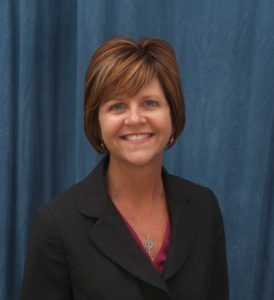 Kellie Watson, Director of Louisville Metro Human Resources, or her designee. Sadiqa Reynolds is also leading the review of Metro Animal Services. 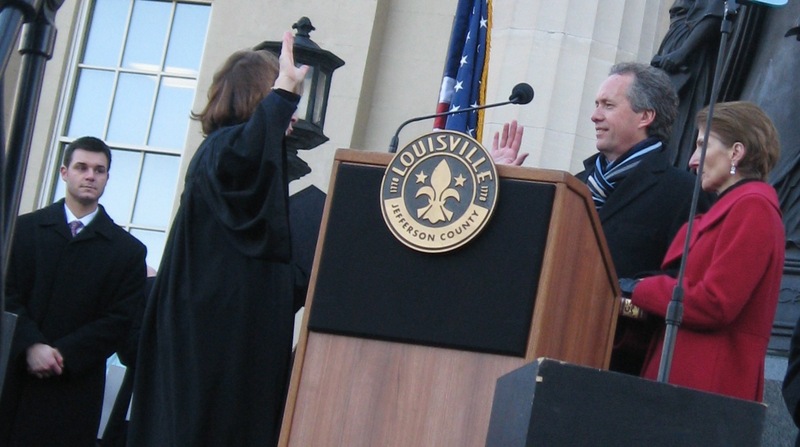 New Mayor Greg Fischer is officially in office. He took the oath Monday. After his speech and a short prayer, fireworks were launched downtown (in the daytime) and the City Hall bells were rung. The fanfare was topped off with a short (two block) parade. Lousiville has not grown as fast as many peer cities, and Fischer acknowledged that in his speech. He said without an educated workforce, Louisville will not be able to compete with those other cities. “The future of our city, the relevance of Louisville as a thriving 21st Century City is what’s at stake here. We will set our sights high,” he said. Fischer then touted the economic benefits of a healthier population. Click here to read more and listen to Fischer’s entire speech. Also taking the oath were newly-elected and re-elected city and county officials, including Metro Council members. Members of Congress and the General Assembly were on the stage, as were the presidents of Spalding and U of L.
Former mayoral candidate Jackie Green was in the audience. Green ran as an independent, but dropped out of the race to support Fischer shortly before the election. I talked with Green afterward. He said “Our work is cut out for us,” but then lamented the fact that Fischer did not talk about sustainability in his inaugural address. “Other cities are aggressively pursuing sustainability,” said Green, re-iterating his campaign talking point that Louisville must embrace environmentally-friendly policies in order to properly grown and succeed in the future. Welcome to 2011. In case you haven’t heard, Greg Fischer will be sworn in as mayor today. Here is a story about what outgoing Mayor Jerry Abramson‘s departure may mean for the city. I’ll be covering the swearing-in ceremony. You can follow along on Twitter.